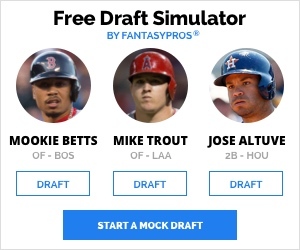 It’s the Week 9 edition of fantasy baseball 3×3, where we’re putting Eric Chavez in the wayback machine, resetting expectations for Yoenis Cespedes, and reminiscing about the days when Gio Gonzalez still had fastball command. 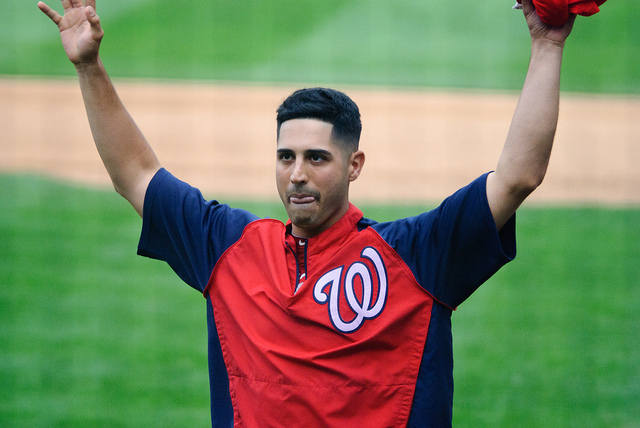 After posting year-on-year improvements in walk rate through the first five seasons of his career, Gio Gonzalez’ current 4.18 BB/9 ranks as his worst mark since 2010. He’s regressed from last season’s career high in F-Strike% and has struggled more than ever to find the strike zone on his subsequent pitches, posting a Zone% below 40% for the first time in his career. There hasn’t been a huge change in the way he’s mixed his pitches this season and hitters are swinging (and missing) just about as often as they did last year; the dip in walk rate is mostly attributable to his inability to battle back with his heater when he’s behind in the count. When hitters are ahead, Gonzalez relies almost exclusively on his fastball, throwing a 4-seamer or sinker more than 85% of the time against both lefties and righties, according to Brooks Baseball. That’s not a big change from his mix in the past, but he’s finding the strike zone with much less regularity this year than he did last season. In 2012, Gonzalez threw his sinker for a ball just 23% of the time in two-ball counts and 18% of the time in three-ball counts. So far this season, those rates have risen to 29% and 45%, respectively. Gonzalez’ favorable BABIP has helped to cover up the impact of his rising walk rate, but when regression comes calling, his WHIP will spike. He’ll still be a useful pitcher and a solid source of strikeouts, but don’t expect his ERA to decline much from its current 3.90 level. Heading into Monday’s action, Ike Davis was one of only ten qualified hitters to strike out in more than 30% of their plate appearances. On its own, this isn’t necessarily a problem. That list includes four players who’ve hit double-digit home runs this season, including useful fantasy assets like Dan Uggla and Mike Napoli. especially in an era when Ks are at an all-time high, the whiffs-for-dingers tradeoff is an accepted reality in baseball. I guess Davis is technically making this tradeoff, but his ratio of only four home runs against 57 punch outs makes the Manhattan Purchase seem like a fair swap. Davis’ .090 ISO ranks as the 20th-worst in baseball, behind relative weaklings like Marco Scutaro and Jose Altuve, neither of whom have totaled more than 15 homers since the start of the 2011 season. Davis’ microscopic .211 BABIP certainly deserves some of the blame, but it’s tough to predict positive regression for a fly ball hitter when only 11.1% of his fly balls leave the yard and 13.9% never make it out of the infield. If you can convince another owner that Davis’ clutch hit on Sunday night portends an end to his season-long slump, pull the trigger. If not, don’t hesitate to drop him outright. The phrase “shoulder soreness” is just vague enough to be terrifying. In related news, Chris Perez has been placed on the DL with a case of that terrifying phrase, following a run of especially poor outings. Vinnie Pestano will take over as closer in the meantime. Typically, an experienced, established closer is worth a DL slot in just about any league, but I wouldn’t be quick to extend that courtesy to Perez. There are three of reasons for this; the foremost one is the simple fact that Vinnie Pestano is a better pitcher than Chris Perez. 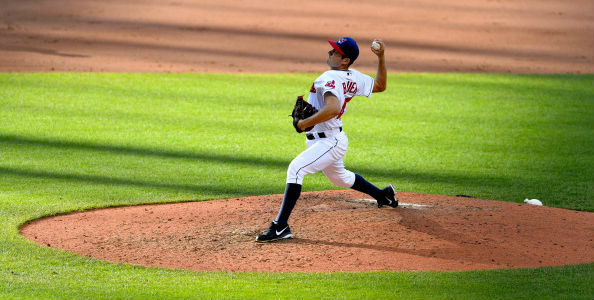 Since Perez took over the full-time closer gig in Cleveland in 2010, Pestano has tallied a higher strikeout rate and a lower walk rate, along with a better ERA, FIP, and xFIP. In those three-plus seasons, Perez has been worth 1.2 WAR, and Pestano has been worth 2.4 WAR. Vinnie Pestano will perform well as the closer because he’s a very good relief pitcher. r=Regardless of when and how Perez comes back, it won’t be easy for Terry Francona to immediately shift Pestano back to his previous role. The second reason is that the Cleveland Indians are acutely aware of the first reason. Perez remained in the closer’s role because that’s where he’s been and because the Indians hoped they could trade him after a hot start; there’s always a market for pitchers with the “proven closer” tag. Unfortunately for Perez, the Indians are in the thick of a divisional race, trailing the Detroit Tigers by just two and a half games as of Monday evening. Terry Francona no longer has the luxury of fattening up his trade bait with save chances; the Indians need to win. The third reason is the first thing I mentioned: “shoulder soreness” is terrifying. I’m typically not one to traffic in baseless speculation, but there’s a distinct possibility that this DL stint could be quite a bit longer than 15 days. With all that in mind, Chris Perez probably doesn’t deserve one of your DL slots, let alone a spot on your bench. After tallying just 424 mostly fruitless plate appearances between 2008 and 2011, Eric Chavez has experienced an incredible renaissance since the start of the 2012 season. He ranks fifth in wOBA, ISO, and OPS among third basemen with at least 400 plate appearances since the beginning of last season. With a .325/.368/.588 slash line through 37 games this season, he’s Adrian Beltre-lite. It feels icky to rely on Chavez after we all wrote him off during the injury-riddled twilight of his career, but a player with this kind of proven power deserves to be owned in way more than the 25% of Yahoo! leagues in which Chavez currently occupies a roster spot. Chavez doesn’t play quite everyday, which is probably a good thing given his checkered injury history, but he has hit in the clean-up slot in each of his last 10 starts. Few National League lineup positions are friendlier; three-hitter Paul Goldschmidt’s .400-plus OBP presents plenty of RBI opportunities. If he can stay in the lineup for 400-plus plate appearances, and I think he can, you can pencil Chavez in for 22-25 home runs and 75-80 RBIs with a batting average better than .275. K/BB rate is my favorite stat for judging pitchers. A strong number there means that the pitcher in question can both command the strike zone and generate swings and misses. It means he can limit baserunners, but he also has the ability to pitch his way out of a jam. Corey Kluber’s 6.14 K/BB ranks fifth among starters who’ve thrown at least 40 innings this season. Among pitchers who’ve struck out at least 25% of the batters they’ve faced, only Felix Hernandez and Hisashi Iwakuma have posted a better K/BB. Somehow, Kluber is owned in less than 5% of Yahoo! leagues. Kluber relies on a diversified arsenal of 4-seamers, sinkers, and cutters to get ahead in counts and generate groundball outs, then follows up with a putaway slider and changeup, both of which have batters coming up empty on more than 40% of their swings. His Zone% is at a career-high level, and he’s throwing strike one more than 60% of the time. As his .351 BABIP regresses closer to .300, his 4.57 ERA will start to look much more like his 3.21 FIP. 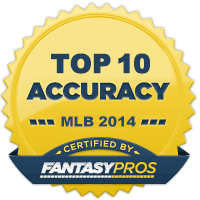 Kluber is a gem in AL-only formats and a worth a speculative pickup in mixed leagues. Finally, the Seattle Mariners have come to their senses and called up Nick Franklin. I’m surprised that the Mariners chose to promote Franklin at the expense of former No. 2 overall pick Dustin Ackley, rather than sending the apparently fire-engulfed bats of Robert Andino and Brendan Ryan to the bench, but that’s beside the point. All you need to know is that Franklin is up with the big club and although he didn’t get the start on Sunday, I’d expect that he’ll be in the lineup just about every day moving forward. Franklin laid waste to the PCL through the first six weeks of the season. He walked significantly more often than he struck out and posted a .324/.440/.472 slash line with seven stolen bases, even while playing in one of the tougher parks for offense in what is admittedly a hitter’s league. Franklin won’t immediately hit a ton of home runs or steal a ton of bases, but he won’t hurt you anywhere. Given the typical dearth of waiver wire options available in the middle infield, not being terrible at anything makes Franklin a must-add is just about every league. Everth Cabrera is a limited player, but a very useful, limited player. He’s not going to be a big help in batting average, he’s not going to hit for any power at all, but he’s going to get on base, and when he does, he’s going to run like crazy. Cabrera has honed those limited skills this season. Cabrera is at his best when he’s patient at the plate and keeps the ball on the ground. For far this year, he has the highest walk rate among qualified shortstops and only three players have a lower flyball rate. What little power Cabrera has shown this season will likely fade away, but he’s not going to stop running. He stole 44 bases in 449 plate appearances last season and with 19 steals through 228 plate appearances this season, he’s only a tick off that pace. 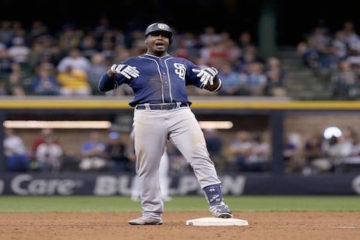 Hitting at the top of the Padres’ order, Cabrera has a great chance to amass over 700 plate appearances this season, making him a sure thing for at least 30 steals the rest of the way. Homer Bailey has finally figured out how to harness the overpowering stuff that made him one of the top pitching prospects in baseball, while still maintaining the improved control that made him a useful starter for the past two seasons. His average fastball velocity is up over 93 MPH for the first time since 2009, his 24.2% strikeout rate is by far the best of his career, and his 6.9% walk rate is only a percentage point removed from the career low he set in 2011. We’ve seen flashes of brilliance from Bailey in the past, but this start doesn’t look like a fluke. His BABIP and strand rate are both right around league average, and his game log shows remarkable consistency. Bailey has tallied at least twice as many strikeouts as walks in all but two of his ten starts, he’s limited the opposition to two runs or fewer in seven of those outings, and posted an xFIP over four just once. The biggest source of negative regression for Bailey will be his home run rate. His 7.4% HR/FB rate will eventually rise closer to his career average of 10.6%, but even then, the fact that he’s dropped his flyball rate to just a shade over 30% and cut his WHIP to 1.13 will limit the damage. Steamer and ZiPS both have Bailey projected for about a 3.90 ERA and a 1.25 WHIP the rest of the way; I’d bet on his improved velocity to improve both by 5-10% with a strikeout rate near 25%. Yoenis Cespedes’ struggles this season are pretty easily attributable to a BABIP that’s slumped to nearly 100 points below last year’s figure, but setting expectations for Cespedes’ future are slightly more complicated. He’s been much more of an all-or-nothing hitter this season, pushing his flyball rate up nearly 13 points to 52.7%, a number bested only by noted 3×3 punching bag Mike Moustakas. Cespedes’ rising flyball rate is less concerning, however, because he’s maintained a solid HR/FB rate. He’s already left the yard nine times, setting a pace to to challenge 30 for the full season. While more fly balls will mean more home runs, it’ll also take a bite out of his batting average. I didn’t expect Cespedes to match his .292 batting average from last year, but given the change in his batted ball profile, I think we’ll have to reset our ROS expectations again. He’ll continue to hit for power, but his average probably won’t be much higher than .270 the rest of the way.